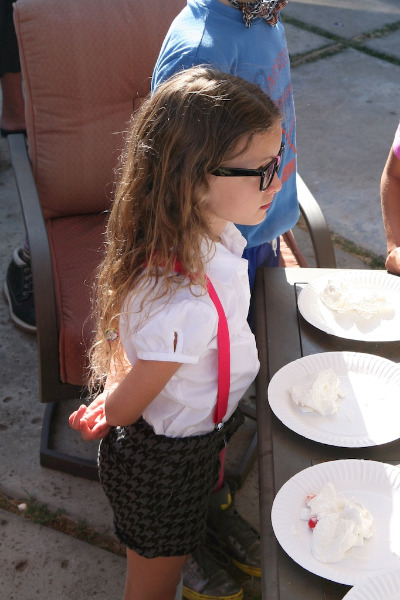 Kids' Nerd Party — my.life.at.playtime. Did I mention this summer was the summer of all parties? Don't get me wrong, that is the best kind of summer there is! We went to a really funny themed one a few weeks ago, it was Nerd party and we had a lot of fun getting our gear together, in fact we found everything in our closet. ~glasses, dollar sunglasses work great if you pop the lenses out, add a bit of duct tape in the center and you're ready to go. ~we also saw kids dressed in floral skirts, with pigtails, argyle pants, Star Wars head to toe themed clothes, Star Trek sweaters, really a trip to Goodwill is all you'll need if you can't find these items in your closet. For party favors, these mini Nerds were great. And these finger lights work awesome to attach to the sides of the kids glasses, they stay lit up and are just about the nerdiest thing I've ever seen! Totally awesome. Games? This one was brilliant and so easy. 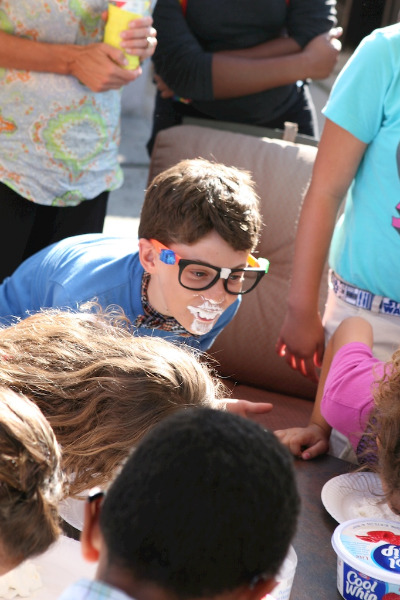 Hands behind your back and everyone had a plate of cool whip in front of them. Using only your mouth you had to search out the pieces of Chicklet gum and hard gumballs. Once you find them all, the first one to blow a bubble wins. Have you tried to blow a bubble with hard, stale gumballs and Chicklet gum pieces? Hilarious and fun to watch. Next time you throw a party, how about a unique theme? I love the planning of the party almost as much as the party itself.